Prosthetic leg "seeks" owner after fake limb is found in Pa.
GLASSPORT, Pa. - Police in one western Pennsylvania borough are working on an unusual lost-and-found case involving a prosthetic leg. 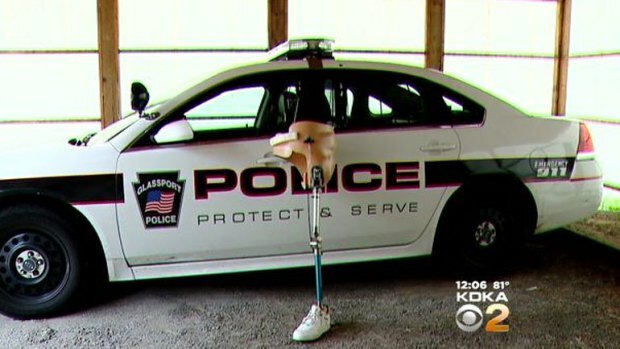 Glassport police Lt. Ron Benoit tells CBS Pittsburgh that investigators haven't been able to determine whether the artificial limb was lost or stolen since a motorist found it lying along a road June 21. Police know the serial number of the artificial limb and say it was manufactured by Hanger Inc., a leading manufacturer of prosthetics. The company won't release information about serial numbers, except for recall notices, but police are hoping to use the number - and a shoe found on the prosthetic - to identify the owner. The lieutenant says, "It's an expensive piece of medical equipment. We'd like to get it back to its rightful owner."